Sony’s latest Icons of Horror box set celebrates Hammer horror films by presenting four classics, beautifully restored and shown in their original aspect ratios. Hammer is best known for revitalizing and reinventing the horror genre during the 1950s and 1960s with a series of stylish takes on Dracula, Frankenstein, and other staples of the genre. The Two Faces of Dr. Jekyll (1960) is Hammer’s take on the Robert Louis Stevenson classic Dr. Jekyll and Mr. Hyde with Paul Massie playing the unhinged doctor with a very dark side and obsessed with two personalities that he believes exists inside of everyone. Jekyll aims to achieve a state where man is above good and evil. Kitty (Addams) is his long-suffering wife who does not understand her husband’s work and she takes on a lover played by the omnipresent Christopher Lee. This is not the strongest take on the Jekyll/Hyde story and tends to get bogged down on story and character development that isn’t all that interesting. What does work is Massie’s portrayal of Hyde as a suave and good-looking figure and Jekyll as bland and anonymous. Scream of Fear (1961) begins in dramatic fashion with a German officer and his partner retrieving the dead body of a woman from a lake. Penny (Strasberg) returns home to live with her new step-mother Jane and her recently ailing father who is away on business. We learn that Penny’s real mother died from drowning two years ago. Confined to a wheelchair, Penny discovers the dead body of her father in several spots around the expansive family estate despite Jane’s assurance that he’s away on business. Is Penny’s mind playing tricks on her? Is the family doctor (a suave Christopher Lee) in on it? There’s an effective scene where Penny, frightened, beats a hasty retreat from seeing the body of her father only to fall into a swimming pool. We see her almost drown from her point-of-view. It’s a very effective and exciting scene. The Curse of the Mummy’s Tomb (1964) begins in Egypt, 1900 as a French explorer is killed and his hand chopped off – pretty graphic for back then, even if it does look quite fake. We soon learn that he and his fellow British explorers have unearthed a sacred tomb of Prince Ra-Antef and the locals are not thrilled with the actions of these infidels. Of course, the explorers don’t heed the locals’ warning and take the mummified remains of a Prince Ra and his possessions to London. The journey is plagued by problems as an ancient nomadic tribe, sworn to protect the mummy, try to return the contents of the tomb. An opportunistic mogul (Clark) opens Prince Ra’s coffin to the public but it is empty, much to his chagrin. The mummy has been brought back to life and seeks revenge on the explorers. 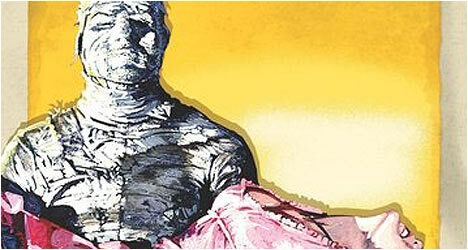 This is an exciting, rip-roaring adventure with a great looking mummy that is quite menacing. Every scene drips with atmosphere, thanks to Michael Carreras evocative direction. In The Gorgon (1964), the town of Vandorf has been plagued by a series of unsolved murders where the victims are turned into stone during the full moon. Namaroff (Cushing), the local chief medical examiner testifies that the latest death is as a result of the victim’s boyfriend but when the man’s father claims that she was killed by a Gorgon, a snake-haired supernatural being capable of turning people into stone, he decides to investigate further. Director Terence Fisher expertly sets the tone for the film in the first scene when an artist’s girlfriend becomes the first victim of the Gorgon. It takes place on a moonlit night in the country with appropriately eerie music. The Gorgon features a cool premise but there are significant plot holes which are distracting as almost no one takes the Gorgon threat seriously despite the bodies having been turned to stone! Despite this, the film really takes off once Christopher Lee’s professor arrives in the town and begins throwing his weight around as only he can. In an age where studio created horror films favor flashy computer generated special effects over a strong story and good dialogue, the Hammer horror films are breath of fresh air. While some of the films come across as slightly cheesy and a tad dated, the best of the bunch contain richly textured atmosphere, strong performances and engaging stories. There vintage theatrical trailers for all four films.